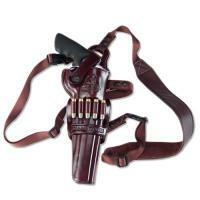 Galco Kodiak Shoulder Holster FREE SHIPPING! Galco Kodiak Shoulder Holster incorporates both shoulder and torso straps to maximize your comfort when out hunting with your magnum revolver. Galco has crafted this rig for full adjustability based on your varying field activities, be it walking or driving, or even the weather and your changing clothing needs. The Kodiak can be worn with equal weight distributed across the shoulder and the torso, or you can tighten the torso strap to take weight off of the padded shoulder strap, as desired - adjustments are easy, no special tools are needed. Galco's Kodiak includes both straps and the holster already assembled; bandolier is sold separately and is optional for use. ©2002-2019 CopsPlus.com: Galco Kodiak Shoulder Holster FREE SHIPPING!